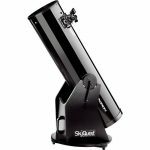 The Orion SkyQuest XT6 Classic Reflector Telescope offers some of the best optical clarity and easy to use features in a telescope that would have to be about the best value for money out there. 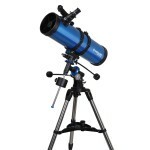 Whilst it is one of the most affordable Dobsonian mounted telescopes on the market, this device is worthy of 5 star ratings (have a look at the Amazon reviews – 5 stars is no exaggeration!). Why 5 star ratings for a cheap telescope? Well, the Orion XT6 Classic is not just great value for money, but actually gives anyone from a beginner to a budding enthusiast with the magnification to reach beyond the level of interest from the moon to the planets, and literally to the stars beyond. So what we are talking about is the ability to bring the aspirational dream into an astronomical reality. If you have ever stared at the moon, or maybe used a low power telescope as an introduction to astronomy, you may have just piqued your interest level to take it to the next step. Well look no further, the Orion XT6 offers you way more than you could have imagined, and indeed will more than open you mind to a whole new realm. This telescope features an professional level parabolic mirror housed in a sturdy steel optical tube, and designed for optical clarity. Therefore you get more than entry level performance at a bargain price. Rest assured this telescope is not a toy! It really is quite a large device, but it comes mounted on an ultra stable Dobsonian base frame that allows you an easy to adjust platform for that all important viewing session. 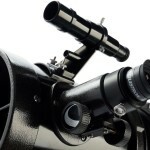 The challenge for any astronomer is the ease of the point and view capability, and this device offers a high quality of optics to surprise and stun, and the mounting platform to make you look like a pro! 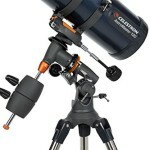 In fact you really will look like a pro with this excellent telescope. Be the envy of all your friends with this professional looking device, and for those who have never experienced such a clear view of the heavens, this device certainly has the power to impress. Setting up is very simple, the Orion XT6 has a convenient carry handle, you can set it up by yourself with no trouble at all, and you can maximise your viewing pleasure – anywhere you can find a suitable viewing point. This could be from the convenience of your own backyard, or a remote, quiet mountain, remember this Orion XT6 is perfectly portable and lets you enjoy the views wherever you choose to be. Don’t forget the additional items that are included in this deal. You also get a 2 inch Crayford focuser tool, and Ezy Finder aiming device, an extra Sirius Plossl eyepiece and a quick collimation cap all come with the standard inclusions with this device. This means that you won’t need to go out and spend more money just to get started – you have everything you need in this one package! 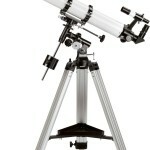 Click Here to look closer at the Orion SkyQuest XT6 Classic Reflector Telescope.